Another cloudy day is expected across the Rio Grande Valley with pockets of scattered showers and highs in the 60s, according to the National Weather Service in Brownsville. 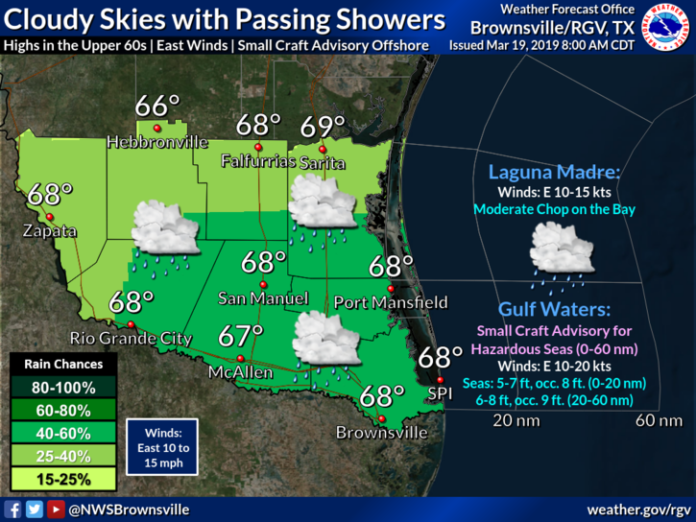 McAllen will be 67 while both Brownsville and South Padre Island are expected to reach 68. If you do visit South Padre Island, there will be dangerous rip currents. An advisory is an effect until 7 a.m. Wednesday. Make sure to swim near a lifeguard and stay in knee deep water or less.